The rendering of the scene graph happens internally in the QQuickWindow class, and there is no public API to access it. There are, however, a few places in the rendering pipeline where the user can attach application code. This can be used to add custom scene graph content or render raw OpenGL content. The integration points are defined by the render loop. There are three render loop variants available: basic, windows, and threaded. Out of these, basic and windows are single-threaded, while threaded performs scene graph rendering on a dedicated thread. Qt attempts to choose a suitable loop based on the platform and possibly the graphics drivers in use. When this is not satisfactory, or for testing purposes, the environment variable QSG_RENDER_LOOP can be used to force the usage of a given loop. To verify which render loop is in use, enable the qt.scenegraph.general logging category. The render thread prepares to draw a new frame and makes the OpenGL context current and initiates a block on the GUI thread. 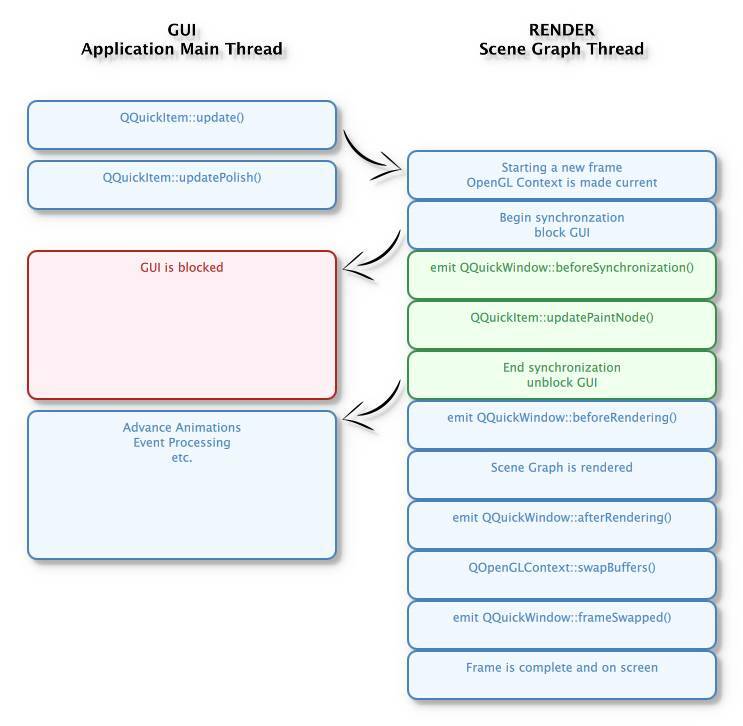 The threaded renderer is currently used by default on Windows with opengl32.dll, Linux with non-Mesa based drivers, macOS, mobile platforms, and Embedded Linux with EGLFS but this is subject to change. It is possible to force use of the threaded renderer by setting QSG_RENDER_LOOP=threaded in the environment.